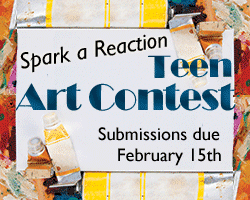 Hey teen artists: the deadline is fast approaching to submit a design to our Teen Summer Reading Artwork Contest! Submissions started on January 2nd, and the last day to submit your entry is February 15th. Click here to get all of the contest details and the entry form. (PDF) Good luck!